Every now and again a book has an impact. 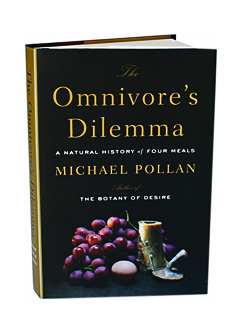 Michael Pollan’s book Omnivore’s Dilemma had an effect on me. Granted it’s not a new book, but it is new to me. I think it was because I had watched the movie The Cove just a couple of days before I started reading the book. There are probably lots of factors from watching plastic bottles float by while sailing in the middle of nowhere to just wondering if giant corporations really worry about the food they serve up. We know the answer to that. But reading the answer has me giving up consuming animals since August — not to say that I will forever stay in this lane, but I guess it gives me a break and saves a few fellow earth inhabitants from being eaten. Not to mention the energy that we expend in creating animals for consumption. The book is eye opening — not that you haven’t suspected everything it has to say. But by the time you get to the industrial organic deconstruction of even Whole Foods — well you’re (I) was just ready to give the whole ordeal a rest and stick with vegetables for a while. This entry was posted by John Pasmore on Thursday, October 7th, 2010 at 5:38 pm	and is filed under Environment and tagged with michael pollan, omnivore's dilemma, the cove. You can follow any responses to this entry through the RSS 2.0 feed.